The human family once contained a lot more than just humans, with all sorts of weird off-shoots developing over the course of our evolution. Like humans with the head of a gorilla. But by far the weirdest is “the hobbit” (Homo floresiensis), a 1 meter tall species of human that lived about 13,000 years ago. That last part is what makes them especially weird, as by that point the only humans supposed to still be alive were your boring, generic Homo sapiens. As such there’s been a lot of debate over whether the hobbit really existed, or whether it was just a modern human suffering from some pathological condition. In the decade since its discovery the evidence has always landed in favour of the “it’s actually a different species” hypothesis; but now a team of researchers think they may have finally figured out the disease responsible for this alleged “species”. It’s a fairly bold claim that’s, understandably, been leapt on by most media outlets; from ABC (the Australian version) to the Skeptics’ Guide to the Universe to creationists (who seem to think any mistake by those pesky evolutionists vindicates their position). And most are reporting the research uncritically, with even the “skeptics” guide only including a single sentence at the end of their article urging caution. So surely these studies are solid as a rock (I mean there are even two papers1,2, surely that has to count for something)? Well, as you may have guessed from the title of this article, there’s actually a fairly substantial problem with this research that really undermines the conclusion. In a word (or two) this problem is “cherry picking”. Whilst the researchers did a thorough job of examining all the bits of hobbit anatomy associated with the symptoms of Down syndrome they ignored all the other bits of their anatomy; which just so happened to include parts that contradicted their diagnosis, or which it couldn’t explain. It’s a bit like hypothesising someone died of a knife to the stomach and upon finding said knife declaring victory; all the while ignoring the rest of the body, including a gunshot wound to the head. Actually I think that analogy is a bit too harsh (but sadly the only one my hobbit-sized intellect could come up with) as the researchers are far from incompetent. As I said, they did a thorough examination of the symptoms which did at some points require very ingenious analysis to circumvent the lack of data1. But still, their omission of key aspects of the hobbits’ anatomy that disagree with their diagnosis fundamentally undermines their conclusion. The most important such piece of evidence is the wrist of the hobbit. A lot of research has focused on this bit of their body as it’s part of what makes the hobbit so weird. You see, over the course of our evolution our wrist changed from an ape-like joint to the modern one we have. Our new wrist evolved at some point between 1.8 and 0.8 million years ago and, you’ve guessed it, the hobbit had the old, ape-like version. A wrist not seen in modern humans for 800,000 years. I don’t think Down syndrome explains that. (Their second paper on the subject does briefly mention the wrist, but quickly dismisses it because it was not part of the original definition of Homo floresiensis and contradicts one of the hypotheses abiut its evolution. Because researchers are never allowed to examine new data and must only consider one idea at a time. #sarcasm)2. Similarily, their humerus lacks the rotation seen in modern humans (which is why, if you stand up straight, your elbow faces inwards slightly). Their shoulder blade is also angled more forwards than ours (which may be what the lack of rotation was compensating for). Crucially, whilst this is very different from what you see in modern humans it does seem to be the norm in Homo erectus3, rather than modern people with Down syndrome. On top of all that, there’s also the fact that imprints of their small brains suggest that, relatively speaking, they had the large, long frontal lobes typical of modern humans (which makes their old wrists extra mysterious)4. Meanwhile people who suffer from Down syndrome typically have shorter, squatter frontol lobes than normal. I’m can’t say much more about this as the neurology of Down syndrome is not my strong point; but this is yet another piece of evidence that doesn’t fit in with this model. In other words, there’s an awful lot of evidence thst contradicts the Down syndrome hypothesis (and supports the idea the hobbit really was a distinct species); but these were missed by the researchers as they were looking for symptoms of Down syndrome. Nobody looks for it in the wrist, so that was ignored. Yet those are the bits that contradict their hypothesis and until they’re addressed they render the Down syndrome explanation unconvincing (although the fact several similarities could be identified is quite interesting, and worthy of a further look). 3. Larson, S. G., Jungers, W. L., Morwood, M. J., Sutikna, T., Saptomo, E. W., Due, R. A., & Djubiantono, T. (2007). 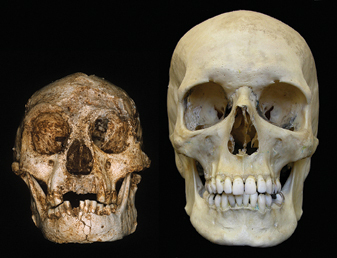 Homo floresiensis and the evolution of the hominin shoulder. Journal of human evolution, 53(6), 718-731. The hobbits level of encephalization is equal to that of the Australopithecines but well below that of Homo. But it doesn’t have a craniodental morphology as robust as the Australopithecines. So I’d guess that it was a direct descendent of the Ardipithecines. It probably migrated out of Africa before the Australopithecines evolved. I assume that it probably got to Flores from South East Asia during rafting events (hanging on to floating tree branches broken off and tossed into the sea after a major tropical storm) floating along ocean currents until they accidental reached Flores. An extinct hominin type specimen that had DS? Why not, if a tiger can? Fossils of congenitally pathological individuals are attested in the fossil record and has to be considered beyond the simplistic thinking this is either a pathological modern human or a new species. I was surprised colugos have hydrocephalus, which is regarded a pathology in most mammals. But it is nonetheless normal for the flying ‘lemurs’. Even if LB hominin was pathological, it might still be typical for their population then. Without intelligent mammalian predators to avoid it cant be ruled out that a mental pathology became selectively neutral on Flores. One of the implications of molecular eutherian phylogenies is that various mammals have become secondarily lissencephalic. This is even more remarkable than the hydrocephalic colugos; when a human or rodent is born lissencephalic, it has seizures. Because functional lissencephaly would probably require reversal of several neuronal character states at once, this ought to be impossible. Nonetheless what we assume pathological can become normal. The notion that the pathology was present throughout the entire species wasn’t something I’d really considered; but you make a great point. Particularly given how every fossil discovered thus far has these characteristics. That said, I’m not sure we have a complete enough example of the species to make a conclusive diagnosis.